Nokia officially unveiled its new budget smartphone Lumia 625 that is successor of the Lumia 620 model. Nokia also previously launched Lumia 1020 high end smartphone earlier in this month. 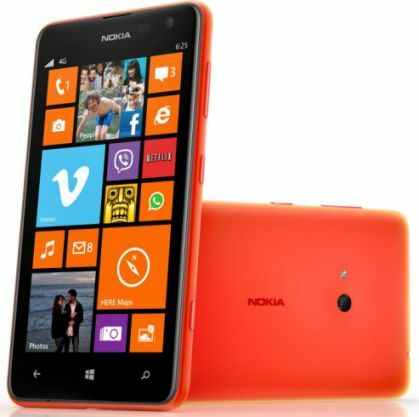 Lumia 625 features a 4.7-inch IPS LCD display with the resolution of 800x480 pixels. The display has the some specialties including Corning Gorilla Glass 2 protection, sunlight readability, High brightness and Super Sensitive touch. The device runs on Windows Phone 8 Operating System and powered by a 1.2 GHz Snapdragon dual-core processor. Nokia Lumia 625 has 512 MB of RAM, 8 GB of internal memory and the external memory can be expandable up to 64 GB with microSD cards. The phone features a 5 MP rear camera with auto focus and LED flash and it has also 0.3 MP front facing VGA camera. It comes with Nokia exclusive apps such as Nokia Music, Here Maps, Nokia Smart Camera and Cinemagraph. It supports the connectivity options are 4G LTE, 3G HSPA+, Wi-Fi, Bluetooth 4.0 and GPS. Nokia Lumia 625 will be available in five colors like orange, yellow, black, green and white. The estimated price of Lumia 625 is 220 Euros (It is approximately Rs. 17000 in Indian rupees without taxes). The phone will be available in Quarter 3 of this year 2013.